UK’S FAVOURITE DAD JOKES REVEALED! Check out our new short video giving you all the best Dad jokes from our #FunniestDads #FathersDay Campaign! As the only trade show in the world dedicated to the greetings card industry, PG Live is an exciting event for all card publishers, distributors and retailers alike. Taking place this year on Tuesday 2nd and Wednesday 3rd June, Danilo are just one of the 200+ companies who proudly exhibited at the Business Design Centre in London. And we were delighted to show off some of our spanking new card ranges including #PawPatrol, #Minions #5SOS #GoggleBox. We have some great news for any Take That Fans!! 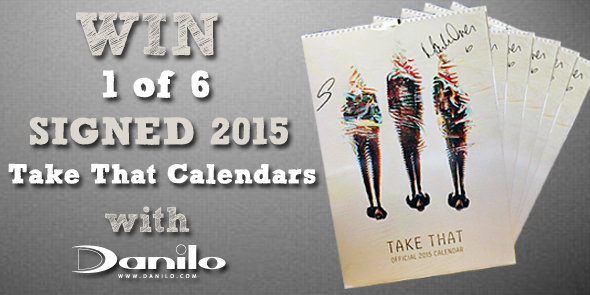 We have 6 of their Official 2015 Calendars to giveaway!! But these aren’t just any Calendars, they have been signed by GARY BARLOW and MARK OWEN!